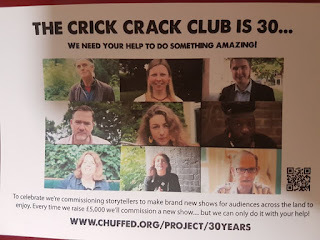 Tonight, back with the Crick Crack Club - at Soho Theatre this time, with Nell Phoenix telling us all about Tricksterland: a favourite theme of hers! I hesitated about booking it, to be honest, having heard the theme so often before - but the stories described in the event info sounded new, so I risked it. There were leaving drinks this evening, but I had a meeting anyway, so just hung on for a bit afterwards - it's less than a 10-minute walk from (this) office to the theatre, and it wasn't starting till eight. I left about 7:30 - collected my ticket, and hovered around the bar. Nostalgically.. ah, for the days when the Man with the Hat would have booked us a couple of tables, chalkboards on them with his name, and the time they were booked for. (I remember one occasion when one of the actors performing that evening had the same name, and his family invaded our tables..!) It's always very packed, you see. 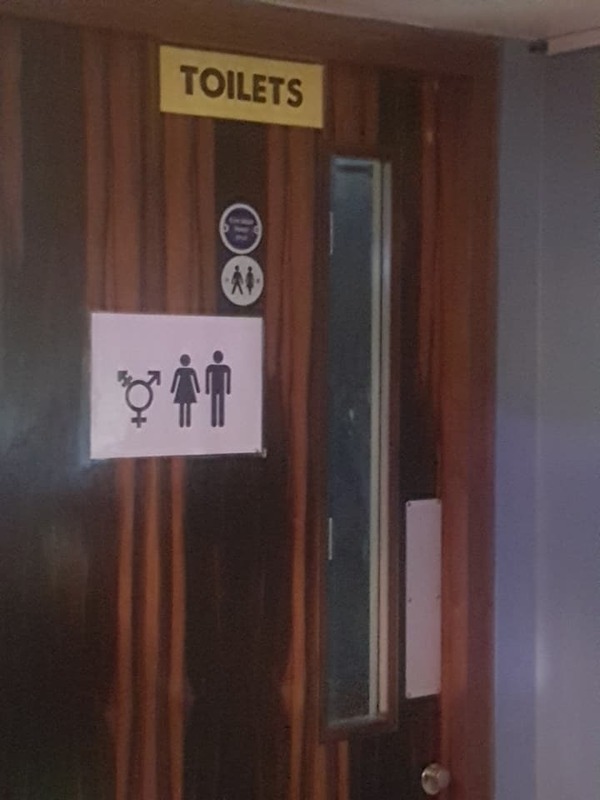 I didn't get a drink there tonight - it just wasn't the same, on my own. Glad to see they're catering to the transgender community! Wouldn't you know, just as I finally got a table to myself, it was time to go upstairs! I was literally first in the door - passing Ben Haggerty en route, overseeing things as usual, and with Nell peeking out of a side room. I took a seat front row centre - wouldn't miss a thing - and it duly filled up, only one latecomer tonight, who sat in the seats by the door that are reserved for such. After the customary introduction by Ben, Nell came on - demurely. The performance lasted for 75 minutes straight through.. and well, she had to tell us the story of the Weasel sisters. Who were, as she explained, women, and weasels - and sisters! My gosh, these Weasel sisters had some adventures over the next 75 minutes.. some of which I'd heard in other forms, but none quite like this. And wow, was I glad I'd come.. she was absolutely on fire tonight, electrifying as she inhabited the spirits of the various creatures she described: the canny older sister, the scatty younger one, the meandering moose, the bear that was more concerned with honey, the starmen.. and, naturally, Wolverine, without whom no trickster story would be complete. 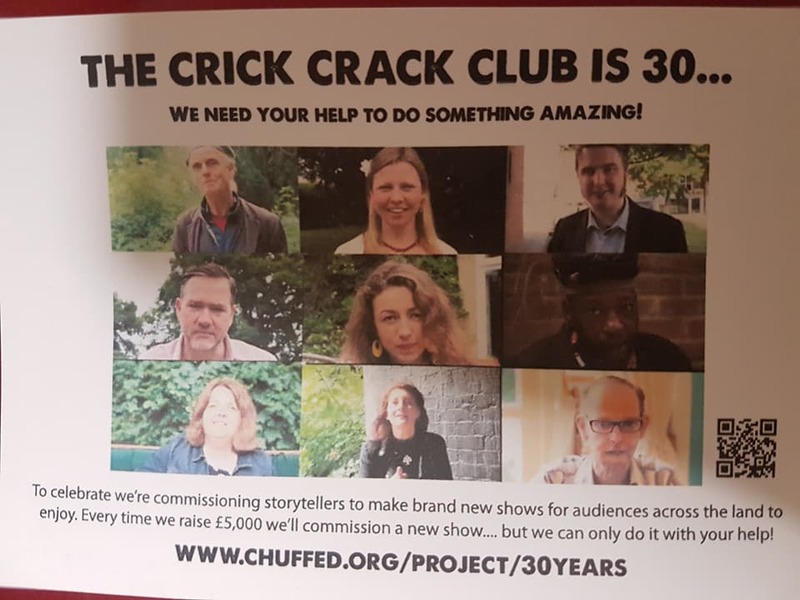 No, not the Marvel one..
(L-R, top to bottom; Hugh Lupton, Emily Hennessy, Tim Ralphs, Nick Hennessy (Emily's hubbie), Clare Murphy, Tuup, Sally Pomme-Clayton, Nell (bottom centre), and Daniel Morden.) And others. And I, for one, will give them all the advertising I can manage! Donate at the link in the picture. Afterwards, it was just too crowded to be searching for other members, and I came home. Tomorrow, I'm with the London European Club (first time in ages!) - we're off to the Barbican for a dance production by the Michael Clark Company. On Wednesday, Walking Victorian London is doing a walk called Alexander Pope's The Dunciad. On Thursday, Up in the Cheap Seats is off to Albion, at the Almeida. Then I'm back to Ireland for the weekend again - hopefully, by that stage they'll have cleared the roads following Storm Ophelia. And Storm Brian. Next Monday, I finally get to see Apologia, at Trafalgar Studios - London Dramatic Arts was going to this a while ago, but it was far too expensive on that occasion. Well, that's what you get for having Stockard Channing and Laura Carmichael in it! Amazon Tickets again. And finally, I'm hoping for a nicely scary Hallowe'en.. when I heard that they were doing the first-ever stage production of The Exorcist - and what's more, it's on in the Phoenix Theatre, right behind the office.. well, that was fate, wasn't it?! I jumped to get a ticket for that, as soon as they went on sale - after all, Hallowe'en has to be its most popular night! Jenny Seagrove plays the mother of the demonically possessed teen..